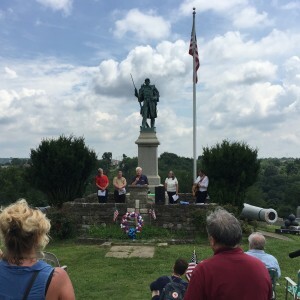 I shared some thoughts based on this essay at the Battle of Homestead Foundation‘s gathering at the Pump House on the morning of the commemoration. Three days ago, while I was touring the Gettysburg battlefield during the 154th anniversary of the great conflict, I found myself distracted with thoughts of our own, small Pennsylvania borough with its own anniversary this week. Both Gettysburg and Homestead loom large in American history for violent clashes during the first week of July, but they couldn’t be more different in how that history has been integrated into the larger American narrative. People generally understand that the Battle of Gettysburg was the bloodiest and most decisive of the Civil War. The Homestead Strike, however, is unfamiliar to the average American, as I have discovered in the three years since I began researching our town’s history in depth. I am usually met with blank stares when I explain how this decisive, bloody showdown between steelworkers and industry magnates over a living wage sent labor rights into retreat for close to fifty years. The Battle of Gettysburg transformed a small town into a tourist destination. Its present-day identity dates back to the immediate aftermath of the 1863 battle, when painter Col. John Bachelder interviewed wounded soldiers to mapped the battlefield and identify the exact sites of key events. When the townspeople began dismantling the fortifications, local lawyer David McConaughy bought up land for preservation. Today the town’s old buildings and original landscape, down to fences, cannons, and even shells, are remarkably preserved. Regimental flank markers and elaborate monuments fill the battlefield. As a result, there is much for tourists like me to see and experience. I was one of tens of thousands who took bus tours, walked the battlefield, visited museums, watched reenactments, and met historical interpreters. Though the Battle of Homestead is neglected today, in 1892 it became famous even before it began and sensational for months after the long-anticipated confrontation turned violent. After it concluded there was no attempt to preserve its sites and artifacts. The steel company owned the area of the daylong battle between the town’s steelworkers and the company-hired Pinkerton paramilitaries. It immediately returned the land to use and continued transforming the landscape as its growing operations required. The opera house that held the Pinkertons after the townspeople attacked them during their attempted surrender continued as a social center for the town and was renovated to keep up with the town’s growth. It was torn down in 1941 along with the half the town to accommodate expansion of the steel mill. The Bost building, headquarters of the union, housed an ever-rotating lineup of organizations and businesses, like all buildings on Homestead’s main thoroughfare, and townspeople soon forgot what had happened there. For decades, Homestead contained no physical markers of its most famous event. If anyone noticed any of this neglect, no one dared to protest. After the strike failed in November 1892, the steel company took active steps to suppress not only the union, but also any attempts at re-unionization. They developed a pervasive system of espionage. Workers they caught could be blacklisted for years. “If you want to talk in Homestead you must talk to yourself,” sociologist Margaret Byington quoted a resident in her 1910 study of the town. Who would dare to speak up for historical memory when you worked brutal hours, lived in miserable poverty, and risked even worse? The silence affected more than the landscape. During my Gettysburg visit, I attended a performance by my second-cousin Myra Reichart, a historical interpreter born and raised in Homestead, and marveled at how many authentic, eye-witness accounts she incorporated in her multifaceted re-telling of how the town’s women fared during the battle. I realized with a jolt that for Gettysburg there is a corpus of thousands of first-hand accounts from soldiers and civilians alike, and for Homestead there are almost none. Our great-grandfather lived there during the strike, just a few doors down from the Bost building, but whatever he experienced he did not say. Thousands of participants and thousands of townspeople like him also did not talk about what they witnessed, because it was too dangerous. As a result, none of the numerous, scholarly accounts of the strike contains anywhere near as many personal dimensions as Myra’s one-hour monologue. Historians cannot recover silenced voices, but preservationists and activists can reclaim a landscape. Four years after Homestead’s steel workers were reorganized in 1937, the young union erected a 9′ tall granite marker commemorating the steelworkers killed during the Homestead strike. The spot they chose ensured anyone driving over the bridge from Pittsburgh to Homestead would spot it. A more significant wave of efforts began after the town’s steel mill closed in 1986. Where resignation and despair marked Homestead at the end of 1892, in the ’80s and ’90s a grassroots coalition of labor activists and historical preservationists, now known as the Rivers of Steel National Heritage Corporation, coalesced around the cause of sustaining Homestead’s legacy. Thanks to their efforts, this week’s 125th commemoration is taking place in locations that did not exist during the 1992 centennial. On Friday, a reception took place outside the Bost Building, now known at the Rivers of Steel Museum, which the organization re-identified, purchased, and refurbished after decades of neglect. This morning, people will gather on the site where the strike took place in a building known as the Pump House. An unremarkable structure that appears in photographs of the battle, it has been remarkable for the very feat of its survival. The whole town is now dotted with numerous historical markers related to the strike and the subsequent labor history it inspired. At last an anniversary of the battle is taking place on the very site where the battle took place, something Gettysburg visitors have always taken for granted. Battle of Homestead Foundation president John Haer speaking at the Civil War memorial in the Homestead Cemetery at the start of the commemoration ceremony. Both the history we celebrate and the history we neglect say something about who we are as Americans and what we value. While strong attendance is expected at today’s events, and the evening program has sold out entirely, the number of attendees I will join is only a fraction of the visitors with me earlier this week. Perhaps the difference seems obvious: the Civil War, of which Gettysburg was a part, is one of the defining conflicts in our country’s history, while the battle between labor and capital—a battle that is just as surely for the soul of our nation and for the rights of its people—has never found a secure place in our country’s narrative. We find ourselves once again in an age defined by the widening gap between workers and corporations. Once again, the arguments of both sides in the Battle of Homestead – a living wage vs. market forces, dignified work vs. technological advancement – are unexpectedly resonant. Having fewer surviving voices from the past from which to learn makes it that much harder to hear the voices of people presently being left behind in the name of efficiency—and yet, if we want to pull through our present challenges with less trauma than in 1892, we need to do a better job of listening than our predecessors. It starts now. 125 years ago today, forces representing America’s greatest industry and America’s greatest asset were met on the banks of a river in Homestead. We can change our country’s future by better honoring this great turning point in American history.